We have been taking samples of the microlayer to eventually seen the algal n-Alkane composition of it after separating the microorganisms from the water. The purpose of this research project is to know the health of the bay over time. 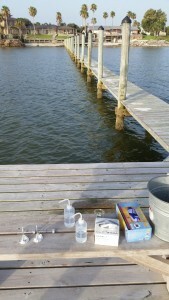 Over the month of July, we took 6 samples every Tuesday and Thursday from the bay as our field experiences and separated organic molecules from a previously collected sample as our lab experiences. The purpose of sampling so early is that the water is nearly smooth and has no waves. As the wind picks up and the water moves more, gathering the sample and getting an accurate sample would become more difficult. We would clean our glass pane and teflon scraper using ethanol and deionized water to make sure no microorganisms were on their surfaces before taking our sample. We would spray the glass with the ethanol first then wipe it until it was completely dry, then we would spray it with the deionized water and wipe it off until it was completely dry. This was done between each gathering of sample. Then using a rope tied to the top of the glass pane, one person would sit on the edge of the pier and drop the glass into the water. Another person would have our sample tubes, a funnel, and the teflon scraper. As one person pulled the glass up out of the water, the other would catch the water coming off the glass with the funnel and sample tube. We would then use the scraper to get as much water as we could off the glass pane. Once we had about 10 mL (less than half the tube full) we would put a top on it and stick it in our ice cooler. Once we had 6 vials of sample marked and dated, we went back to the lab to start separating n-Alkanes from previously collected samples. This process was very specific, and cleanliness and making sure there was no more water in our samples after extraction was most important. Once the previous samples had time to come to room temperature and we gathered our materials, we would begin the process. Using a separation funnel, we would put the sample in first. Then using a syringe, we would put 300 mL of n-Alkanes into the sample. We would then clean the vial containing the sample with DCM (Dichloromethane) to make sure all the sample was out of the tube and put it into the separation funnel. We then put the top on the funnel and began mixing the DCM and the sample for 2 minutes, allowing it to breath every 10 shakes so the top wouldn’t pop off. DCM evaporates very quickly, so it creates pressure inside the funnel. We then let the funnel sit for about 2 minutes so the DCM had time to separate from the water. DCM is more dense than water, so it settles at the bottom of the funnel. After the DCM separated, we would get a new vial and ONLY let the DCM out or the funnel. There is a clear separating line between the water and the DCM, so we just had to be very careful to not allow any water to pass through into the new vial. After separating the DCM, we would fill a small graduated cylinder 5 mL full of more DCM and add it to the remaining water in the separation funnel. We would mix it for 2 minutes and let it sit 2 minutes to separate again before separating that DCM out of the sample as well. We would do this one more time, then put the vial of extracted sample into the fridge. This is done for every sample. The next step will be for Dr. Silliman to separate the DCM from the microorganisms in our extracted samples, and find the algal n-Alkanes. The reading of the algal n-Alkanes over time will be able to help him and his students to know the health of Corpus Christi Bay. We learned that we had to be very particular about the way we went about collecting data and separating microorganisms from our sample. Every tool we used to collect the sample had to be cleaned thoroughly between each extraction. The lab materials we used had to be cleaned and ashed to ensure complete sanitation. If we had the slightest doubt about our materials, we did not use them. The precision of the tools we used had to be perfect or our samples could become contaminated. This is an important part of science to ensure authenticity of our results and the credibility of the scientists working on the project. 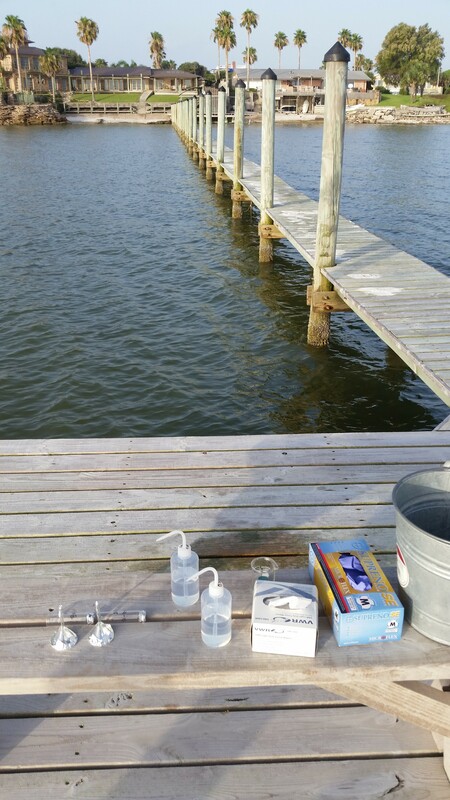 Would the results from the samples from the bay vary from samples possibly taken from an estuary near by since there are more terrestrial microorganisms? Could we use the results from our samples to predict when Corpus Christi may have red tide? Could we compare our city tap water with the samples to see if there are any similarities? Would the amount of jellyfish or small fish around our extraction site have a significant affect on our results? Since we do not have the proper materials to do something like this at a school (especially low income), I think the best way to connect this to teaching is to talk about how to keep Corpus Christi bay and the Earth healthy. Recycling, lowering pollutants, overfishing, and being aware of the climate change are all ideas our students need know. They need to know how each of these connect to each other, and what we can do to take part in taking care of our home. Students can make use out of recycled materials, create a form of media to inform the community about pollutants and overfishing in the Gulf of Mexico, or discuss how the Greenhouse Effect changes the earth’s climate by recreating the idea for a science project. We could also take about algae’s role in the bay’s ecosystem, and how it helps the ecosystem or how it can hurt the ecosystem if it is unbalanced.